(back of our consignment boutique)! Price determined by length of class & number of students. Sign up for emails with updates about our class offerings. Please let us know what you are interested in learning! Founded in Boulder in 2007 by Sarah Tracy, the Creative Lab is a place where highly skilled fashion & craft teachers share their knowledge & passions with the community in a relaxed & inspiring environment. Whether you want to start with simple home crafts, launch a small clothing line, find a creative option for your little one, or explore a new hobby, we have the class & encouragement for you to begin a new chapter as a skilled & confident stitcher, designer & maker! Come CREATE! One of our longest running classes! Workshop for the younger, crafty set. 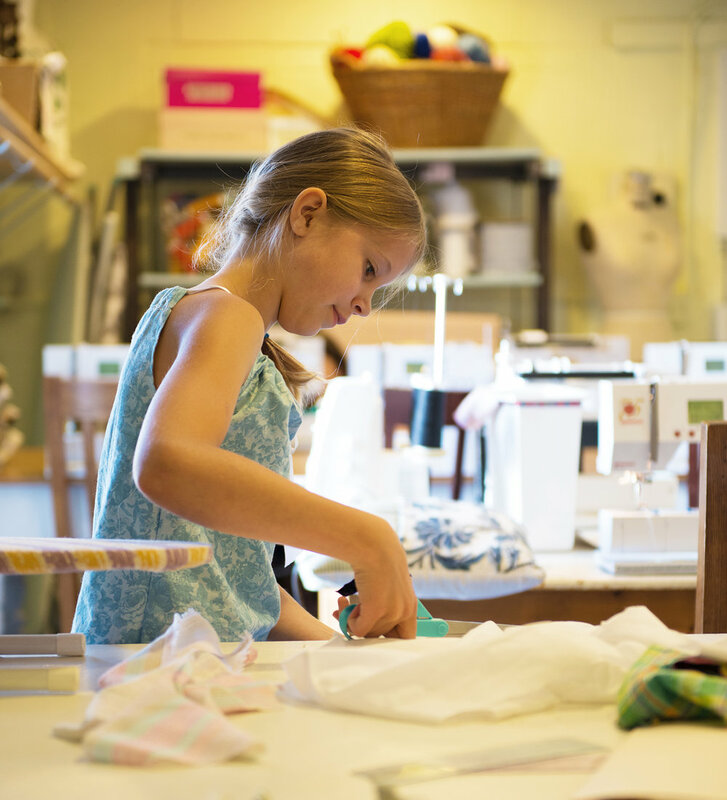 Kids ages 7-10 learn everything from machine sewing basics to advanced techniques. Projects include bedroom décor, easy garments, stylish accessories. Every creation is the child’s own vision. Beginners & non-beginners welcome! Workshop for the younger, crafty set. 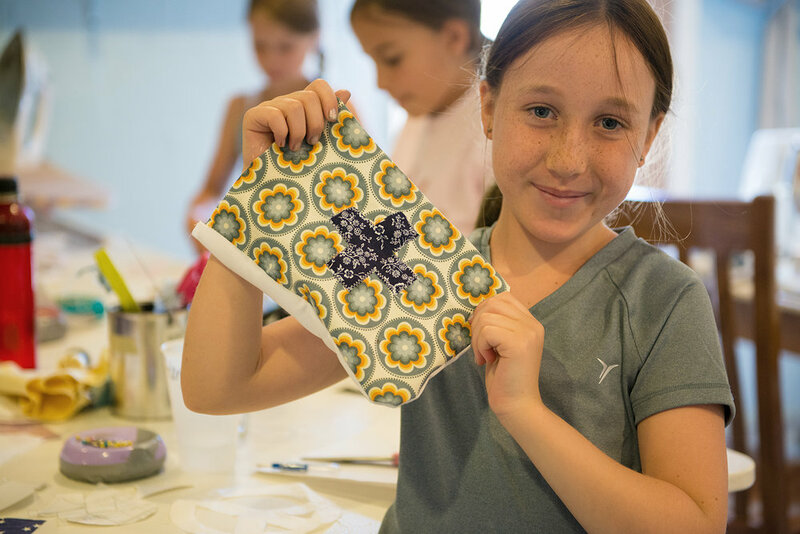 Kids ages 7 and up learn everything from machine sewing basics to advanced techniques. Projects include bedroom décor, easy garments, stylish accessories. Every creation is the child’s own vision. Beginners & non-beginners welcome! Get your girlfriends together & make a simple beach cover up on in evening or a beach bag in two session - we will be happy to accommodate your choice of project. Wine provided - bring some snacks to share. Join us for an easy one-time class to make the most basic of clothing, that will become a favorite staple. We will be making an easy style of skirt to make from start to finish & you will leave with the skills to make any type again on your own. Bring 1 1/2 - 2 yards of cotton or other lightweight woven (non-stretchy) fabric. One session. Students enjoy relaxed, high-quality instruction to learn a new skill, beginners & non-beginners welcome! Everyone leaves with finished projects & creative satisfaction: simple garments, room decorations & stylish accessories. Participants should bring a bag lunch. Ages 7-14. Easy, useful, indispensable & a nightly reminder of how cool & skilled you are. One day class to learn easy garment construction & some great tricks which can be applied to a range of projects. Machine experience required. Students should bring 2 1/2-3 yards of flannel or other soft cotton. We renamed this school-day version of our popular summer camp! Students ages 12-16 learn from local master Ruth Wright: the ins & outs of working with a pattern & how to put it together from start-to-finish. Everyone learns pattern reading, advanced sewing techniques & how to get a perfect fit. Great for the budding designer or the stitcher looking for a new challenge. Infinite design possibilities & new patterns every session, so repeat students are welcome. Adults wanting the same, should check out Make your Own Clothes - How to use a pattern. Class meets 5 times. Find a great pattern at the fabric shop & have no idea how to read it? Before you get discouraged, know that it is not easy! Feel confident that with a little language & symbol reading training you’ll be able to handle any pattern. Come to this multi-week workshop to learn what all those diagrams mean & how to get on your way to whipping up garments in an afternoon. Materials list upon registration. Class meets 3 times. Examples of other classes we offer: Gumdrop Pillow, Market Bag, mother/daughter sewing, Jewelry Making, Draping, Fashion Sketching, Knitting & Crochet.